» A Western Movie Review by David L. Vineyard: THE MAN FROM GALVESTON (1963). A Western Movie Review by David L. Vineyard: THE MAN FROM GALVESTON (1963). THE MAN FROM GALVESTON. Warner Brothers, 1963. Jeffrey Hunter, Preston Foster, James Coburn, Joanna Moore, Edward Andrews, Kevin Hagen, Ed Nelson, Karl Swenson. Screenplay: Dean Riesner, Michael S. Zagor. Director: William Conrad. The Man From Galveston features one of the most famous figures of the old west that no one has ever heard of, Temple Houston, the last born son of legendary statesman and adventurer Sam Houston. Although the character played in the film is called Timothy Higgins, this was the pilot for the television series Temple Houston, and released theatrically because it proved too good for television. In the film Higgins (Jeffrey Hunter) is a colorful circuit riding lawyer who takes the case of “soiled woman,” Rita Dillard (Joanna Moore) on trial for her life for murder and as much on trial for her lifestyle as the crime. Higgins has to not only defend his client, but also solve the murder and change the mind of a jury who would as soon hang her for her life choices as her crimes. 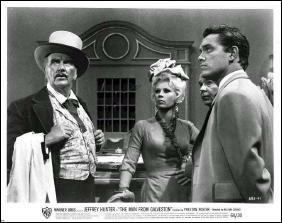 Preston Foster is the judge, and Grace Lee Whitney a madam (more or less, this was originally made for television). Coburn distinguishes himself in the film, and Hunter is surprisingly relaxed and comfortable playing the flamboyant Higgins (Houston), a man who is part Perry Mason and part Paladin from Have Gun Will Travel (this was not television’s first western lawyer — Peter Breck played a gunslinging lawyer in Black Saddle). The mystery is both fair and fairly revealed. 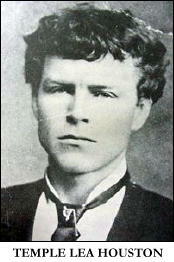 In one of his most famous cases he was appointed by a judge to defend a man accused as a horse thief. Told to give his best legal advice, Houston was set in a room alone with his client. When the law returned the window was open and the defendant was gone. “I gave him my best legal advice,” Houston is said to have claimed. The real Temple Houston died fairly young at age forty five. His biography, Temple Houston, Lawyer With a Gun, is by Glenn Shirley. But Houston is best remembered by a name other than his own. Edna Ferber’s novel of the opening of Oklahoma, Cimarron features as its hero a flamboyant gunfighter, newspaper editor, lawyer, and adventurer Yancy Cravatt, based on Temple Houston. 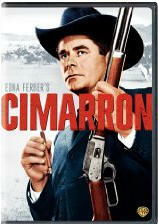 The part was played by Richard Dix in the Oscar winning first film of Cimarron and by Glenn Ford in the remake. Both films feature the famed “soiled dove” case as a dramatic high point. Incidentally, the twelve man jury found Houston’s client innocent of all charges, and when he died the largest selection of flowers at his grave were sent by her. The short-lived television series that followed this pilot never really jelled and could not make up its mind if it was a mystery, trial series, or comedy. 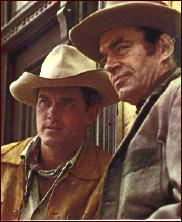 It regularly teamed Hunter with Jack Elam and lasted only one season. 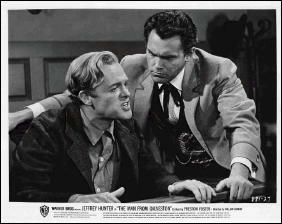 But The Man From Galveston shows what might have been, a sort of frontier Perry Mason crossed with standard gun-fighting tale. Certainly Houston was colorful and unusual enough to have carried such a series, and even here in the guise of Timothy Higgins his personality shows through. Note: Some information in this article is taken from the Wikipedia entry on Temple Houston and the Glenn Shirley biography. Editorial Comment: From the photos of each that I was able to add to David’s review, I’d say that Jeffrey Hunter was a very good choice for portraying the real Temple Houston. I remember the show with Jeff Hunter and loved it, although I thought they eventually ruined it with the unneeded comedy. And, it was a pure delight to see dear Jack Elam as a hero for a change.